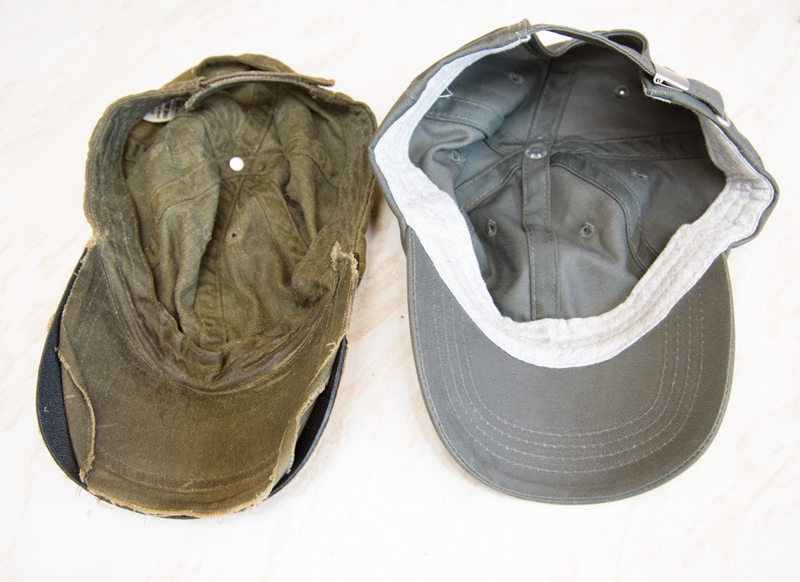 Checking back through this blog I see that my current baseball cap has been covering my bald patch since March 2007. No wonder it was looking tired. It had been looking tired for at least eighteen months if I'm honest. Faded, frayed and falling apart it has character, but it's getting annoying having to trim bits of thread which dangle before my eyes from the peak. Into the home for retired fishing caps it goes. Obviously it's pristine replacement would be a sure fire blank inducer. Luckily when I arrived at the lake the wind was cold enough for me to require a woolly hat. One with a proven fish-catching track record. The baits hadn't been out half an hour when the boilie rod was in action. I was fiddling with a replacement rig at the time and when I got to the rod the run stopped. I knew that rig was a poor one for tench. The rig swap was made and out it went with another bag of mixed pellets of uncertain origin. 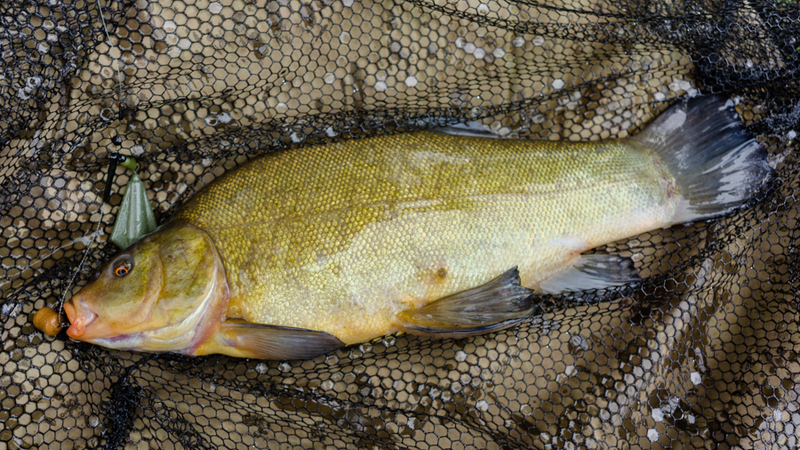 It wasn't long before the bobbin dropped back on that rod and this time I connected with a small-feeling tench. It fell off half way in. Bugger. A third cast and a third take which stayed attached all the way to the net. 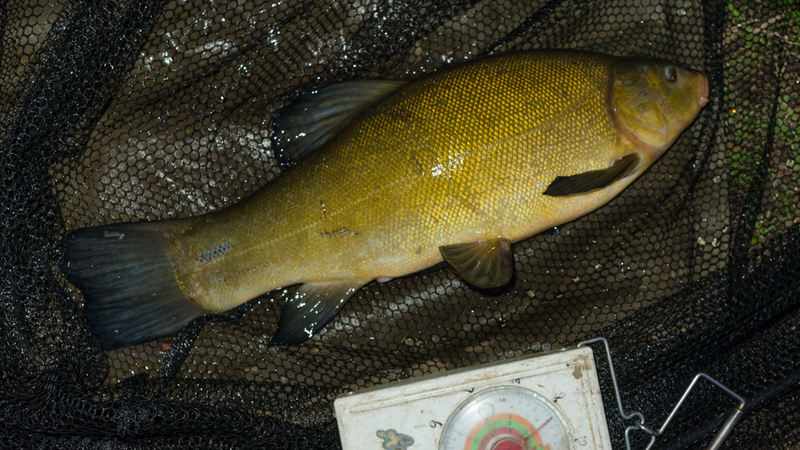 Despite being a small male that wasn't much more than two pounds at a guess it was my first tench of the year. The wind had dropped, the sun was shining and the evening was warming up. Time for a hat swap and on with the new cap. The alarms stayed silent as I watched first a flock of sand martins, then one of swallows, feeding on high. I counted seven great crested grebes, three pairs and a singleton, on the lake. The midges were far too numerous to count, no doubt providing good feeding for the hirundines and the bats which appeared as darkness drew in. With the sun setting so the air chilled and the woolly hat was dug out again. This was the signal for another take to the boilie rod. Who says lucky hats don't work? A slightly more feisty fish, a little bigger I guessed the female to weigh around four pounds and used the sling and scales to check. I had overestimated by half a pound. The length was there but she was a skinny fish. Looking at the fish in the net I could easily imagine a non-tench angler guessing a pound or even two more than I had. Carp are a different build to tench, rounder in cross section if you will, and so weigh heavier for a similar length. Hardly surprising so many seven and eight pounders get caught by carp anglers from waters where tench anglers struggle to catch anything close to those weights. 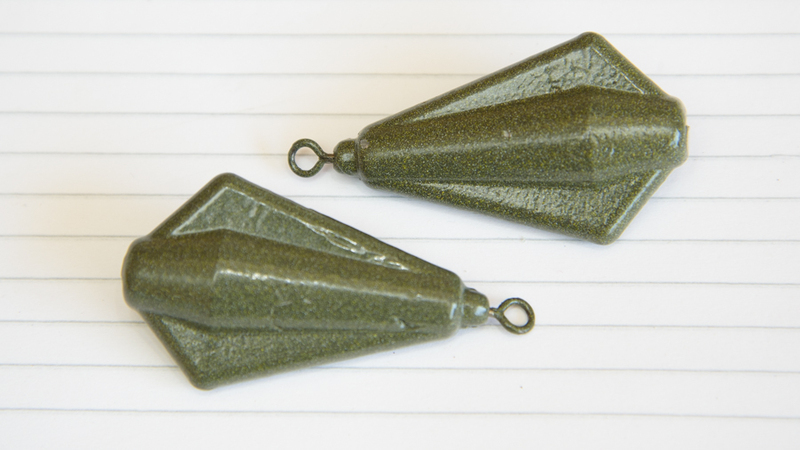 Guessing weights accurately comes with familiarity of weighing fish of a particular species. That's why I never decry newcomers to pike fishing weighing the jacks they catch. Some hardened pikers seem to make a big thing out of never weighing anything less than ten or twenty pounds, depending how much they want to impress their acolytes. Unless they have weighed fish less than those weights in the past, how can they judge when a pike is worth their while getting the sling wet for? Even when you have the necessary experience an unusually fat or thin fish will come along and throw you one way or the other. I fished on into dark for nothing more than two or three liners, only one to a bait that wasn't the boilie. I much prefer catching tench using tench tactics, but if they want boilies I'll give them to 'em. I just hope the pesky carp keep away from my baits. One plus point to take away from this short session was that the cheapo flat leads I'd bought work a treat in PVA bags. They also seem to plane up on the retrieve, an added bonus. Considering I bought them originally for piking I'm well chuffed.